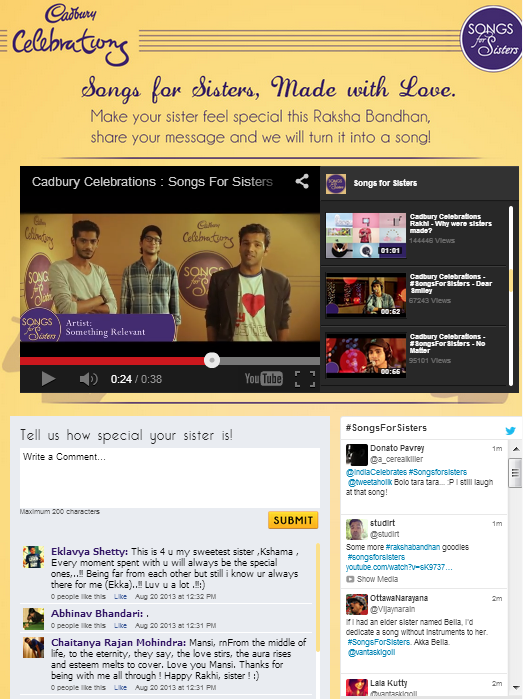 Review of Cadbury Celebrations RakshaBandhan campaign on social media 'SongsForSisters' where brothers can send in messages for their sisters and see it converted into a song. The whole of India has donned a full-on festive mode beginning August. And brand marketers are wringing dry every occasion to bring out the best offers they can. Beginning with Friendship day, Eid and Independence Day, the focus is now on RakshaBandhan, the festival of brothers and sisters. While sisters tie rakhis to their brothers’ wrists, brothers are lured into buying them worthwhile gifts, while promising to protect them. 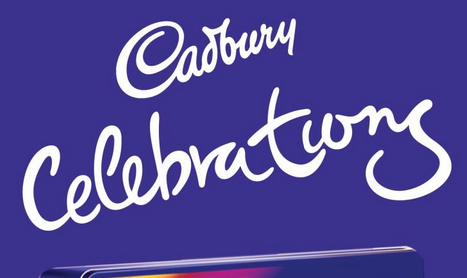 Cadbury Celebrations – a potpourri of Cadbury chocolates to be gifted on special occasions – has found the perfect day in RakshaBandhan. I happened to see a YouTube video ad yesterday where the chocolate brand has made a unique proposition to brothers; it has asked brothers to share messages for their sisters on the brand’s social media platforms, and India’s leading bands like Spud in the Box, Something Relevant will then turn it into a song dedicated to her! The campaign is rightly named ‘SongsForSisters’ and is the sweetest thing to do by Cadbury Celebrations, one that will be long remembered. Apart from YouTube ads, the most popular chocolate brand has leveraged both Facebook and Twitter to spread the word. The Facebook wall is actively inviting its 3.8 million strong fan community to send in their messages. A simple Facebook app serves as a one-stop destination to see the videos that have been created and also to share your messages for sisters. The app displays all the videos in the top half, whereas the bottom half is dedicated to the community. As can be seen in the screenshot, fans can leave their messages in the empty box provided. The right side pulls up all the conversations around #SongsforSisters from Twitter. On Twitter, simultaneous buzz is being created with the hashtag #SongsForSisters, where brothers have been invited to send their messages. The Twitter handle has been busy spreading the word with the hashtag. A Twitter contest around it is also luring users with gift hampers. SongsForSisters has created a new and beautiful benchmark for brands who want to bond better with their communities. Having fans’ messages converted into songs makes for memorable experiences. Beautiful concept indeed! The campaign has an adorably designed Facebook app with a neat layout, however it should have been tested thoroughly. The video within the app refused to load in Firefox and IE; the area was blank. It was only in Google Chrome that the videos loaded correctly. Also, the right list of videos was displaying some warning messages at the beginning. I hope these bugs get fixed soon, but it would have been better had I not faced them at all! Cadbury Celebrations always has cool campaigns for Rakshabandhan. Last year, the brand had created a virtual map on a Facebook app, where wishes could be sent by siblings across cities and these would light up on the map. These were in combination with other activities on Facebook and Twitter where contests with fans’ sibling photos formed the flavour. SongsForSisters is a sweet concept that is sure to take your heart away, what say?